We’d love your help. Let us know what’s wrong with this preview of Think of England by Martin Parr. Magnum photographer Martin Parr's vision of contemporary England in 100 colour photographs. England has been the key subject of Magnum photographer Martin Parr's work since he started making pictures. Think of England is a comic, opinionated, affectionately satirical, colour-saturated essay about the character of England. To ask other readers questions about Think of England, please sign up. Supersaturated...... bold and iconic...... glorious and inglorious..... The sum of this book is greater than its parts. A wonderful shouting poem of photographs that celebrates life. It makes me proud to be British. Martin Parr has an uncanny ability to picture the absurdity of Western consumer culture and throw it back in our face. His photos are vibrant with color, and the angles, juxtaposition, and macro-focus accentuate the grotesque, pompous, and overlooked elements of everyday interactions. As a Brit, Parr takes us by the hand into the quirkiness of his own national culture, turning symbols on their heads to make his own facetious point. This is one of the most accessible photography books to non-photo Martin Parr has an uncanny ability to picture the absurdity of Western consumer culture and throw it back in our face. His photos are vibrant with color, and the angles, juxtaposition, and macro-focus accentuate the grotesque, pompous, and overlooked elements of everyday interactions. photos of England at play - at the seaside, in cafes, at fetes. The colour is supersaturated. It's funny and sometimes touching, and often disgusting. Parr's pictures show the surfaces of objects from close up, with super-saturated, garish color: Spotty, porous, sunburned skin, bald spots, flaky pastries and chipped mugs with pictures of Princess Diana on them. Everything looks oily. The English people participating in traditional upper class activities--polo, horse racing, fox hunting, cricket--look no different from tattooed sunbathers. Their skin is just as bad. Our wedding photographer said that Martin Parr was one of her inspirations. Martin Parr was born in Epsom, Surrey, UK in 1952. When he was a boy, his budding interest in the medium of photography was encouraged by his grandfather George Parr, himself a keen amateur photographer. Parr studied photography at Manchester Polytechnic, from 1970-1973. Since that time, Martin Parr has worked on numerous photographic projects. 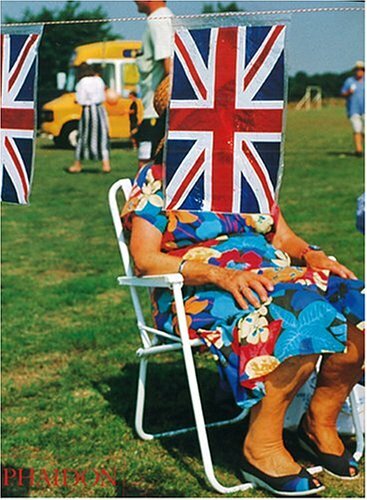 He has developed an international reputation for his i Martin Parr was born in Epsom, Surrey, UK in 1952. When he was a boy, his budding interest in the medium of photography was encouraged by his grandfather George Parr, himself a keen amateur photographer. Parr studied photography at Manchester Polytechnic, from 1970-1973. Since that time, Martin Parr has worked on numerous photographic projects. He has developed an international reputation for his innovative imagery, his oblique approach to social documentary, and his input to photographic culture within the UK and abroad. In 1994 he became a full member of Magnum Photographic Corporation. In recent years, he has developed an interest in filmmaking, and has started to use his photography within different conventions, such as fashion and advertising. In 2002 the Barbican Art Gallery and the National Media Museum initiated a large retrospective of Parr's work. This show toured Europe for the next 5 years.